Although interested in drawing and painting since childhood, it was at the Warsaw Academy of Art, in the years 1904-6, that Čiurlionis developed and matured his style of painting. Influences of his teachers upon his work would be expected; however, it seems that Čiurlionis reciprocally influenced at least two of them (it should be remembered that his works were highly esteemed in his student days and that they did win many prizes). The director of the Warsaw Academy of Art, Kazimir Stabrowski, like Čiurlionis, painted in series and cycles. One such cycle entitled "Tempęs" of 1910 both thematically and pictorially betrays the influence of a similarly named series by Čiurlionis of 1904. It should be noted that Čiurlionis' "Tempest" cycle won the first prize in student competition and in 1905 was purchased by the Warsaw Academy of Art. Almost certainly Stabrowski held this cycle in considerable regard. Čiurlionis' influence is also noticeable in Stabrowski's painting "Lightning" of 1910.2 Another art instructor influenced by Čiurlionis was Karol Tichy. His painting "Kobieta z Posozkim Swiatavida" of 1910 is remarkably similar to Čiurlionis' "The Truth" and "Friendship" painted in 1905-7.3 Thus, in these few examples, Čiurlionis did influence his teachers. How much Čiurlionis may have influenced his classmates is an important question for which this author was not able to find information. Although various bibliographic sources listed a large number of books and periodicals which may have pertinent answers to this question, the original source materials were not available. In 1908 Ciurlionis went to St. Petersburg. It was there that he was to meet and befriend some of Russia's leading artists as well as gain recognition for his artistic accomplishments. This recognition was to come in the form of multiple posthumous exhibits of his art works, performances of his music, reproductions of his work in the art journal Apollon, as well as in critical reviews. It was in St. Petersburg that he was to have some lasting influence.5 6 This influence is particularly noticeable in the works of Nicholas Roerich. While Čiurlionis was in St. Petersburg, Roerich himself was a young (only one year older than Čiurlionis) and developing artist and shared many of Čiurlionis' concerns about art both technically and thematically. Both avidly used the tempera painting technique, and both were concerned with the incorporation of folk traditions in their art.7 It is not surprising that they became close friends and that years later Roerich would continue to express deep affection towards Čiurlionis (see addendum). In terms of stylistic and thematic concerns, it seems that Čiurlionis did significantly influence Roerich. Historical circumstances should be recalled. Čiurlionis stopped painting and left St. Petersburg at the end of 1909 and died in 1911. Roerich became the president of the World of Art (Mir Iskusstva) group in 1910. It was under his directorship that Čiurlionis' works were reproduced in the journal Apollon in 1910, 1911, and 1914, and exhibited widely in retrospective shows in St. Petersburg, Moscow and Vilnius between the years 1911 and 1916. It is known that Roerich was intimately involved in the selection and exhibition of Čiurlionis' paintings in these shows.8 It is not surprising that it is during this time period, 1911-6, that Čiurlionis' works had their most significant impact. One of Čiurlionis' most popular paintings was the "Knight" of 1908-9, not only widely exhibited at that time but also reproduced in Apollon, nr. 5, 1911. In this painting, an ethereal, translucent white rider on a white horse leaps across an abyss in front of a mythical city. This painting had considerable impact on Roerich. His paintings, "White Knight" of 1917 and "White Horseman" of 1918, even in their titles, betray this influence.9 Furthermore, in 1918 in a four painting series called "The Eternal Knights Series," Čiurlionis' influence is evident — influence apparent not only thematically but also in the fact that the paintings are a series (Roerich before this time did not paint in series) and especially in the fact that the sequence was set in time, over a day's period, very much like the time progression in Čiurlionis' season cycles and "cycle Day and Night. "10 The influence of the "Knight" is also seen in three paintings entitled "St. Sophia — The Almighty's Wisdom", "Palden Lhamo", and "Sacred caves", in each of which a white knight gallops across the sky.11 Further, this motif recurs even in Roerich's later works, as in "The Hastening One" of 1924, where an oriental horseman leaps across an abyss.12 Thus, Čiurlionis' "Knight" seems to have had a considerable impact on Roerich's paintings, an impact that was to continue through a significant period of his artistic career. An influence that is possible, but slightly less tenable because of the long duration for its effects to appear, lies in Čiurlionis' and Roerich's common interest in archeology and ancient civilizations. In a number of his works Čiurlionis incorporated hieroglyphic scripts of his own creation, as in the works "Sonata of the Spring, Finale" of 1907 and in "composition" of 1908-9.13 Similar archaic pictograms eventually appeared in Roerich's painting "Signs of Gessar" of 1940.14 If this indeed was an influence on Roerich, then it certainly was a delayed and a long lasting one. In many of his paintings Čiurlionis anthropomorphosed and zoomorphosed clouds — indeed, in a large number of his works clouds are the primary compositional element. This is particularly apparent in pieces such as: "Day" of 1904-5, "Ship" of 1906, "Hymn" of 1906-7, "Journey of a Prince, Tryptych" of 1907, and "Greeting of the Sun" of 1909 (also reproduced in Apollon, no. 3, 1914). It is during the 1913-5 time period that many of Roerich's works started to concentrate on clouds. In paintings such as "At the Boundary" of 1913, "command of Heaven" and "Vision", both of 1915,15 a solitary person, or a group, are viewing the spectacle of the cloud formations which dominate each painting. In these works many of the cloud forms take on animal and human appearances. This is most evident in "The Herald" of 1915 where the clouds appear as heavenly personages chasing each other.16 (This painting is also remarkably similar to Čiurlionis' "Ship" since in both the foreground consists of a boat on water, which is dominated by the activity of the clouds.) Roerich's subsequent works of the 1920's-1940's were to continue incorporating cloudscapes, but primarily as background material. Thus, both in terms of the cloud theme and anthropomorphosis, Čiurlionis seems to have influenced Roerich. The most dramatic example of influence was Roerich's borrowing of Čiurlionis' serpent motif. Čiurlionis' "Sonata of the Serpent", completed in 1908, shows a mythical snake slithering through, towering over, floating above, and lying behind a city (respectively, in the paintings entitled: "Allegro," "Andante," "Scherzo", and "Finale"). The entire sonata was widely exhibited and was reproduced in Apollon, no. 3,1914. The serpent motif was evident in other works by Čiurlionis including "Sonata of the Spring, Allegro" and a theater set design for the Lithuanian opera "Jūratė" of 1908. In Roerich's "The Doomed City" of 1914, a snake menacingly coils about and surrounds a city. In "Cry of the Serpent" of 1913 a serpent screams in apparent anguish while fifteen angels fall from the sky.17 The serpent motif had not played a role in Roerich's work until these paintings. The "Cry of the Serpent" also betrays another influence of Čiurlionis, that of angels. In paintings such as "Angels" of 1906-7 and "Paradise" of 1909, Čiurlionis used many angel-like figures. It is in this 1913 painting by Roerich that, apparently, angels were to first appear. Thus, in the serpent motif, Čiurlionis' influence is almost certain, but also short lived. After 1915 serpents were not to reappear in Roerich's work in this menacing fashion. Thus, the evidence of Čiurlionis' influence upon the works of Roerich is considerable, and in several instances certain. It is also apparent, that outside of the 1913-18 time period, Čiurlionis' influence was short lived and only in a few examples was it to be apparent in Roerich's later works. The oldest and most influential member of the group was P. Fateiav, the only one who actually saw an exhibit of Čiurlionis' works (the rest became acquainted from reproductions). Čiurlionis' influence is most evident in the cosmic theme of P. Fateiav's paintings, of which several were illustrated by slides ('In the cosmic Depth', 'New World', 'Galaxies', and others). Another member of the group, A. Kardan, was a musician, having completed studies in musical composition, as well as an artist and film director, having produced several films concerning scholarly topics. His work distinguished itself by it's composite rhythms, rich colors, musicalness and oriental motifs. One of his paintings, 'Song of the Sea', which was projected, was felt by the speaker to be particularly similar to Čiurlionis. Talking about his own work, B. Smirnov-Rusetski stated that he has frequently painted pictures of a cosmic theme in an attempt to portray the musicalness of nature — not in a superficial sense, but rather in a deeper one — one which is aroused within us. The lecturer showed slides of his works, amongst which one picture from the cycle 'Clearness' he felt was very close to the works of Čiurlionis. Thus, it is apparent, that Čiurlionis substantially influenced a number of his contemporary artists, his teachers: K. Stabrowski and K. Tichy, N. Roerich, Alexander and Nicholas Benois, and a group of five Moscow artists. The information concerning these influences was widely scattered and difficult to find — but what was found does produce a substantive foundation for further investigations of this much neglected topic. Amongst questions that could be profitably studied include the following: what influence did Čiurlionis have on his other teachers and classmates at the Warsaw Academy of Art; can any further information be found concerning the cycles of paintings done in imitation of Čiurlionis by A. and N. Benois; were there further influences of Čiurlionis upon the set designs by A. Benois for the Ballets Russe and upon the theater designs of N. Benois for the La Scala opera company; could any further information be found concerning the group of Moscow artists who were affected by Čiurlionis; and finally, what other artists were influenced by the works of Čiurlionis and to what degree? To this last question, V. Landsbergis expressed a subjective feeling that Čiurlionis may very well have substantially influenced the following artists: P. Anisfeld, C. Annenkov, Boris von Anrep, M. Dobužinskis, O. Klever, A. Moravski, A. Ostroumova-Lebedeva, and K. Petrov-Vodkin.32 A detailed chronologic study of the works and writings of these artists may very well uncover significant influences of Čiurlionis. The author has not had the opportunity to investigate the many extant art historical sources in the United States, Eastern Europe, and in the Soviet Union. Much important and significant information is simply waiting to be found. I hear that the name Čiurlionis is known throughout Lithuania; it has become the pride of the Lithuanian people. I am deeply pleased at this. The recognition of a true gift, in any century and by any people should be welcomed. Wherever heroes, workers and creative minds are valued — there, a bright future is possible. There has been enough ignorance, as we know from many occasions in history, when man's best achievements have been mocked and scorned. There have been enough rejections due to ignorance. A people can live only with positive acceptance and affirmation. When there is creativity there is everything. Not too long ago it was customary to ridicule or skeptically shrug one's shoulders at everything new and unusual. Honestly, these skeptics who, in their callous hearts are prepared to strangle every budding success! If someone comes up with a new form, does the fate of this innovation really have to be mutilation? Let us remember Van Gogh, who chopped off his ear and sent it to his landlord for rent, symbolizing Shylock's notorious payment in flesh. Let us remember how Modigliani died from hunger, that it was only this shocking finish that brought widespread recognition to his works. Let us remember the tragedy of the genius Vrubel, which took place right before our eyes. Did he not go crazy because of all the cruel injustices with which those ignorant savages blasted and hacked away at his lofty insights? Čiurlionis had a difficult life as well. He brought a new, inspirational and genuine mastery. Was that not sufficient to outrage the savages who would defile and abuse it? Something new tries to enter their dusty lives — does this not warrant the most vicious actions in order to protect their smug well being? I remember a quarter of a century ago how the works of Čiurlionis were received with such chilling skepticism. Those petrified hearts could not be touched by the magnificence of form, nor the harmony of graceful, carefully chosen tones, nor the brilliant thought which pervaded every work of this true artist. He possessed a natural inspiration indeed. Čiurlionis immediately gave life to his style, his conception of tones and harmonious agreement. This was his art. It was his medium. He couldn't think and create otherwise. He was not an innovator, but he was new. That is the kind of gifted individual who should be supported as much as possible. Nevertheless, what happened was just the opposite. His most beautiful compositions were regarded with suspicion. While I was chairman at "Mir Iskusstva" (World of Art), we had to interpret much of the art of Čiurlionis. Dobužinskis was very sympathetic. The fine artist and connoisseur Aleksander Benois, of course, felt the profound enchantment of Čiurlionis. But alas, even in the best circles, very many did not understand and rejected it. The finest work of Skriabin too was rejected by just as many. Skriabin and Čiurlionis have much in common. Even the personalities of these two artistic geniuses have many similar features. Someone said that Skriabin came too early. But is it really up to mankind to determine who is to come when in history? Perhaps both he and Čiurlionis came precisely at the right time; it is even probable that this is so. After all, such creative might comes down to earth very rarely. Through their uncommonness and persuasiveness both of these artists, each in his own field, stirred up many young minds. Perhaps we know, after all, where great work is appreciated the most. Not long before his death, Leonid Andreev wrote me "They say I have readers, but / don't know them or see them." The writer's words sound mournful. Another great artist recently wrote me "I feel like I'm talking into a pillow." Truly, the ways of creativity are unknown to us. The formula "inscrutable ways" is quite real. But right alongside this appreciation of his work, of which the artist himself is unaware, there is the intensity of his abilities. Everyone remembers the tragic life of Rembrandt or Franz Hals. But even in this tragedy there is much triumph. Without heroic triumph, the image of the artists mentioned would lose much. Even the bonfires and torches of the savages themselves just serve to light up the way. Without enemies, people would forget a great deal of the most useful and beautiful. In this light, it is not without reason that it has sometimes been necessary to write praises to one's enemies. In his beautifully melodious and tranquil compositions Čiurlionis too could have written praises to his enemies. The savages and enemies together labored a great deal for his future glory. And then it (glory) arrived, this light-winged guest, not simply to spend the night near Čiurlionis' works, but to illuminate them forever. Great is the joy when one can witness that an entire people has recognized its true gift. Not long ago the death of the great writer Corky was observed universally. In this universality there was a cry of recognition from all. This friendly outburst exalting the value of art was beautiful; not because it was to him, who had left (Gorky), but because it was in the name of justice. The recognition of Čiurlionis by the Lithuanian people is beautiful. This too will be not merely a fleeting burst of sentiment, but a lasting recognition; a low bow to a creator and worker. I am made happy by this news from Lithuania about the brilliant artist Čiurlionis. 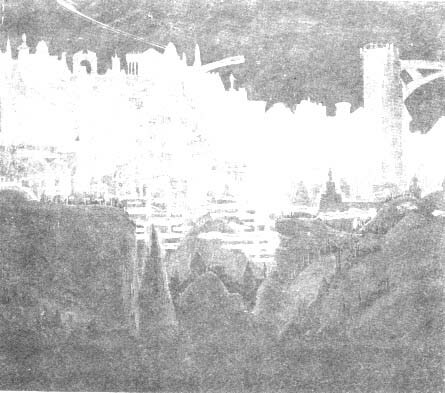 M. K. Čiurlionis, "The City. Prelude," 7908-7909. M. K. Čiurlionis, "Sonata of the Serpent. Andante," 1908. * Dr. Plioplys, a medical specialist, is also an artist and art historian. He has presented one-man shows of his own works, as well as written several original research studies on M. K. Čiurlionis. It is impossible to present all the works of Čiurlionis mentioned in this essay. Many reproductions have been published in this journal. Ciurlionis'^wprks are preserved in the Čiurlionis Museum in Kaunas, Lithuania. Most of his works are reproduced in color in the album Mikalojus Konstantinas Čiurlionis, Vilnius, 1977. 1 Excellent discussions of this subject can be found in M. Nasvytis, M. K. Čiurlionis in Relation to his Period, unpublished Ph. D. thesis, Case Western Reserve University, 1972; V. Landsbergis, Čiurlionio dailė, 1975, Vilnius; and in a number of articles appearing in J. Bruveris, Čiurlioniui 700, 1977, Vilnius. 2 Savickas, A., Peizažas lietuvių tapyboje, Vilnius, 1965, p. 48. 3 Nasvytis, op. cit., illus. no. 136. 4 l. Kostkevičiūtė, "M. K. Čiurlionio reikšmė lietuvių dailėje ir literatūroje" as well as the chapter entitled "M. K. Čiurlionio tema lietuvių menininkų kūryboje" both appearing in Bruveris, op. cit. Also G. Vaitkūnas, "Čiurlionis ir šiuolaikinė dailė", Kultūros Barai (Vilnius), no. 9, 1975. 5 lt should be noted that the Baltic artists in St. Petersburg at that time may have played an important role in terms of being a conduit for western European artistic styles (notably German and Nordic expressionism) to the Russian avantgarde. This does not apply to Čiurlionis as much as to the artists Kublin, Markov, Masyutin, and Vrirault. ). Bowlt, Russian Art of the Avant-Garde, New York, 1976, pp. 24-5. 6 Although influences on poetry are peripheral to the main concern of this article, it is of interest to note that Čiurlionis had a profound impact on the Russian futurist poet V. Ivanov. J. D. West in his introduction to Furrows and Boundaries, Bradda Books, England, 1971, writes: "The Lithuanian painter and composer M. K. Čiurlionis (1875-1911) was at the height of his prominence between 1904 and 1909 — during precisely the five years when the activity of the Russian symbolists was at its highest point. The philosophy which informed his paintings was a remarkable eclectic mysticism tempered by an intense Lithuanian national consciousness. His overtly symbolic paintings, many of them allegorical fantasies of great complexity, fired Ivanov's imagination." Ivanov's fascination with Čiurlionis is also quite evident in his lengthy article "Čiurlionis and the problem of the synthesis of arts" which appeared in Apollon in 1914 (English translation in Lituanus, no. 2, 1961, pp. 45-57). Jurgis Baltrušaitis, another noted poet, also expressed deep admiration for Čiurlionis ("more than value him, more than love him") and hoped to write a book about him — V. Landsbergis, Vainikas Čiurlioniui, Vilnius, 1980, pp. 92-3. 7 Nasvytis, op. cit., p. 160. 8 V. Čiurlionytė-Karužienė, et. 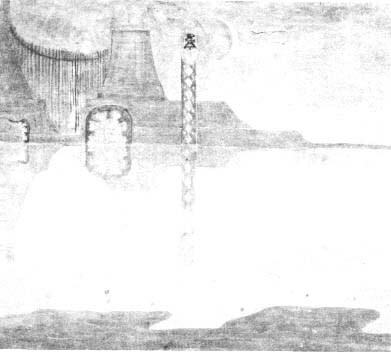 al., Mikalojus Konstantinas Čiurlionis: Bibliografija, Vilnius, 1970, p. 633. 9 Roerich Museum Catalogue, 6th edition, 1930, New York, no. 78 and 423. 10 Ibid, no. 28 to 31. The titles were "The Knight of the Morning," "The Knight of the Evening," "The Knight of the Night." 11 All these paintings have been on display at the Nicholas Roerich Museum in New York City. The dating of these three works is uncertain, but from purely stylistic considerations appear to have been pained between 1914 and 1918 (Ms. Sina Fosdick, director of the Nicholas Roerich Museum — personal communication). 12 Nicholas Roerich, Nicholas Roerich Museum, 1974, illus. p. 22. 13 Mikalojus Konstantinas Čiurlionis, Vilnius, 1977, illus. no. 233. 14 Reproduced in Nikolai Konstantinovich Rerikh, Moscow, 1959. 15 A. V. Yaremenko, Nikolai Konstantinovich Roerich, Central Book Trading Co., New York, 1931, illus. plate nos. 20, 36 and 38. 16 A. A. Reproduced in Rostilowov, N. K. Rerikh, St. Petersburg, 1916 (?). 17 Both paintings were reproduced in Apollon no. 5,1915, Yaremenko, op. cit., as well as in J. Baltrušaitis, Nikolai Konstantinovich Roerich, St. Petersburg, 1915. One variant of "The Doomed City" is on display at the Nicholas Roerich Museum, New York. 18 P. G. Konody, The Observer, London, October 27, 1912, p. 10. 19 V. Landsbergis, Vainikas Čiurlioniui, Vilnius, 1980, p. 93, translated by the author. 20 Macijauskienė, "M. K. Čiurlionis ir Indija", Kauno Tiesa, July 3, 1960, quoted in Čiurlionytė-Karužienė, op. cit., p. 381, entry 2868. 21 Landsbergis, op. cit., pp. 88-92. 22 Ibidl, illus. no. 42. 23 A. Benois, Reminiscences of the Russian Ballet, trans. Mary Britnieva, Da Capo Books, New York, 1977, illus. facing p. 335. 24 M. G. Etkind, Aleksandr Nikolaevich Benua, Moscow, 1965. 25 Landsbergis, op. cit., p. 94. 26 This entry from the memoirs of N. Benois, written in either November or December of 1909, appeared in Laiškai Sofijai, Vilnius, 1973, translated by the author. 27 Čiurlionytė-Karužienė, op. cit., p. 515, entry no. 3767, translated by the author. 28 Letter dated March 5, 1968, written to M. Etkind, quoted in Landsbergis, op. cit., pp. 93-4. 29 V. Landsbergis has attempted to obtain such information from N. Benois by mail on several occasions without receiving a reply (personal communication). 30 Bruveris, op. cit., pp. 195-6. The lecture was given during the conference of September 23-4, 1975, translated by the author. 31 The author has written several times concerning this question to the Society of Russian Artists in Moscow, letters which have not yet been answered. 32 Personal communication, letter written June 7, 1981. 33 Lietuvos Žinios, 1912, no. 15, quoted in Landsbergis, op. cit., p. 93, translated by the author.